MTN back in the black! I went to the MTN results presentation yesterday which was held at the MTN Innovation Centre on 14th avenue in the West of Joburg. The share price of MTN closed up 10% yesterday from what seems like a better than expected set of numbers from a company in turnaround mode. Recall earlier this year management indicated that they will be changing MTN's dividend policy and mr market, as emotional as he is, assumed that management would slash the dividend altogether. Just like we saw from Famous Brands. Fortunately, that wasn't the case as management just rebased the dividend to 500c for the 2018 year and will increase this dividend by 10%-20% per year (earnings depending of course). The management team indicated that they will use the cash to de-lever the balance sheet by paying down debt and continue to focus on spending more capex on infrastructure in order to improve network quality and service for customers. This strategy will help win customers back, which is what the company saw in the Nigerian market in the 3rd and 4th quarter where MTN saw subscribers increase in leaps and bounds. 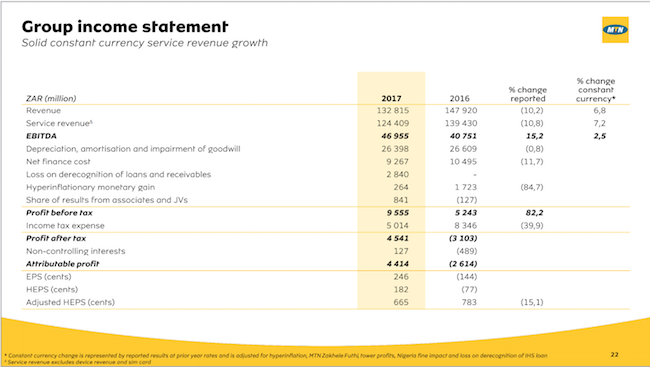 MTN's service revenues were up 7.2% in constant currencies to R124 billion and data revenue was up 34.2% to R28 billion for the full year. The strong rand helps for this company as it buys its equipment in Europe. MTN operates in 22 emerging market countries spread across 3 continents making it one of the purest emerging market telecoms plays. The biggest contributors to the revenue number was South Africa, Nigeria, and Iran with R42.3 billion , R36 billion, and R16.5 billion respectively. The new MTN team has a new strategy in place in Mzansi which will focus on network investment in order to stabilise and win over more postpaid customers. In the fourth quarter the company saw 130 000 new postpaid subscriber additions under the new strict definition which excludes any ghost sim-cards. The company had 12.4 million active data users and data revenues continued to grow at 25.8%. Data and digital growth offset the decline in the voice business. The Nigerian market is ripe for smartphone penetration meaning data, digital and mobile money will be the sources of growth going forward as over 70% of the business is still voice. Nigeria grew subscribers by 2 million in the 4th quarter where voice grew 15% (a rare occurrence in a world where data is the only game in town) owing to the promotion that MTN was running called the "Welcome back offer" where you get 2000% instant bonus. This promotion was targeted at people who ported away from MTN and were disconnected because they were not properly registered. Data revenues grew 86.6% with 14.1 million active data users. Iran is by far the most technologically sophisticated mass market that MTN operates in with the highest smartphone penetration. MTN continues with a major capex programme in Iran to improve customer experience where data will be monetised. The company also saw 2 million new subscribers in the 4th quarter with data traffic increasing two and a half times. 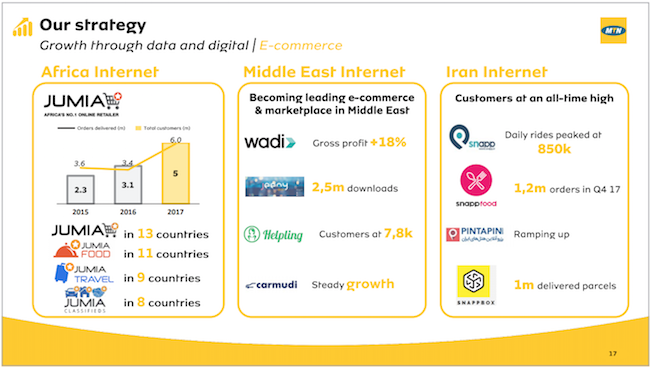 Iran data revenues grew 66.3% with 18.5 million active data users. MTN has a portfolio of moonshot investments spread across the different geographies. MTN is no longer in a loss making position as it is back in the black showing profit after tax of R4.5 billion. We are happy with what the new management is doing and at current levels we think MTN is a buy if the Emerging Markets story is something that appeals to you as an investment. As my colleague Byron said yesterday, this sleeping giant is about to get out of hibernation.